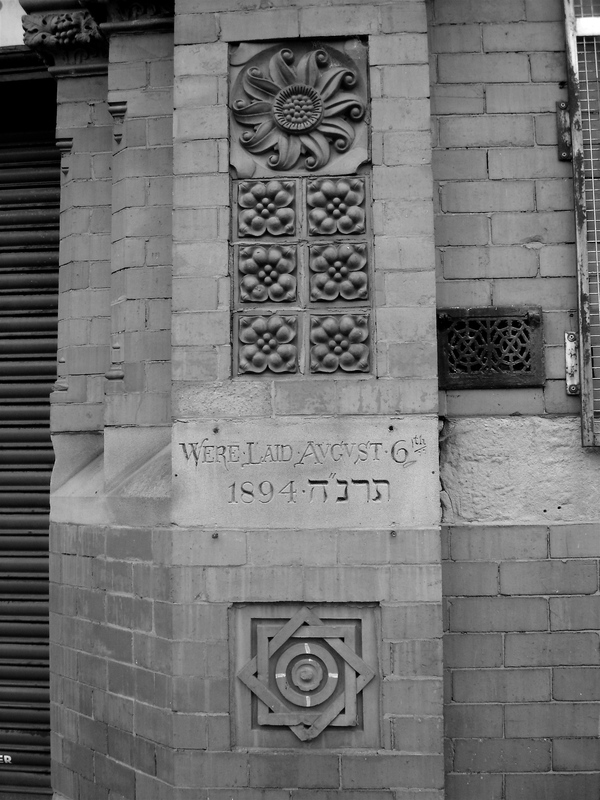 One reason that I was happy to abandon our Sebaldian tour of Manchester before the Northern Manchester Jewish quarter was that I had already made a pilgrimage there some years ago, when I first moved to Manchester. Here’s what I wrote about my pilgrimage at the time. One time, driving into the city through the north inner-city wasteland, I saw a sign for the Manchester Jewish Museum, and one grey moody Sunday I decided to visit. 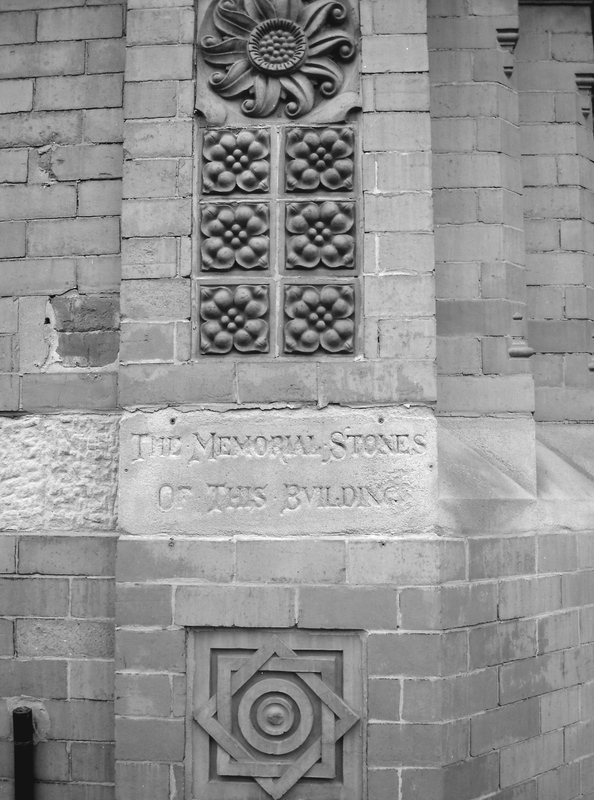 It’s in the old Sephardic synagogue, ten minutes’ walk north from here; full of relics of a lively Jewish community, complete, in that very British twentieth century fashion, with a flurry of self-improving organisations: schools, charitable organisations, amateur dramatic societies, working men’s clubs, all the trappings of a lost community life. But Jewish Manchester hasn’t gone. I am sadly used to wandering around the Scheunenviertel in Berlin and its equivalents in other European cities, stumbling over the Stolpersteine and realising the extent of the lives and communities destroyed by the Nazis. Manchester, though, is still one of the Jewish cultural centres of Britain. 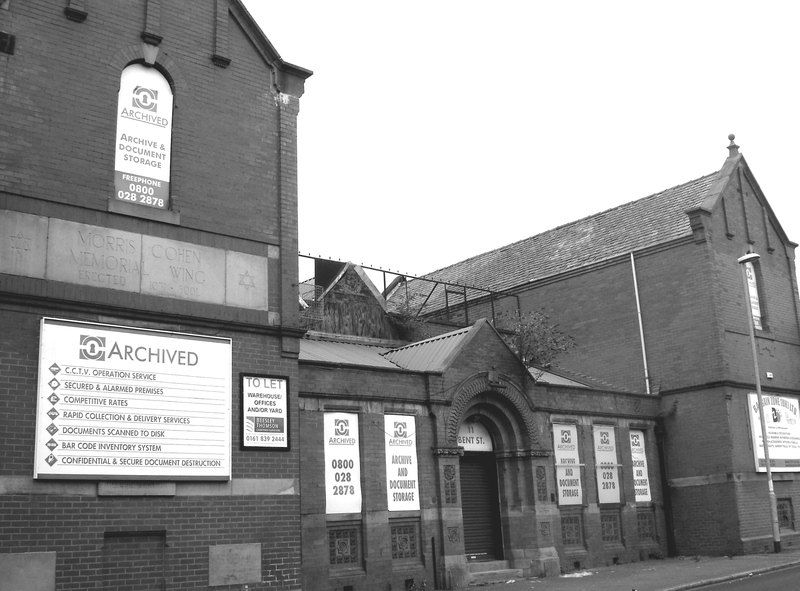 So why was this area – Red Bank and Strangeways, as it is properly called – devastated, triste and empty where once it was full of working-class Eastern European Ashkenazis, Sephardic lords of industry and Gentile Mancunians besides? 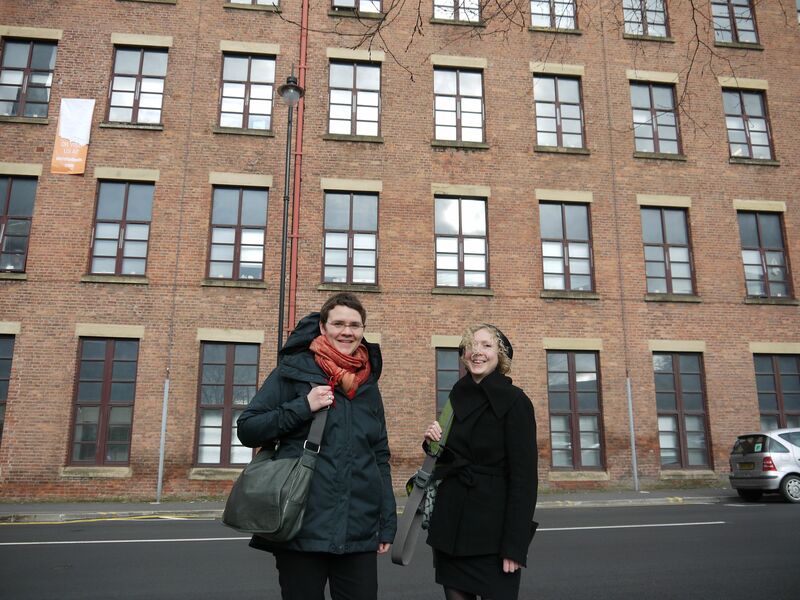 The guide at the museum explained that it had been designated a light industrial zone after the war, so the dwellings were pulled down. “Didn’t the Jewish community feel attacked?” I asked, the forced resettlements and ethnic cleansings of Europe on my mind. “Oh no,” she said breezily, “people were upwardly mobile, and most of them had moved to the leafy suburbs already.” The same story, then, as with Dublin’s Little Jerusalem, where I used to live, which was full of Jewish immigrants in 1900 who had mostly become middle-class and moved to Terenure and similarly salubrious pastures by 1930. No tragic tale, then, just… rezoning. But Little Jerusalem is still an immigrant district, boasting Ireland’s first mosque, full of halal southern fried chicken shops and callshops and African hairdressers. One set of immigrants moves up in society, another moves in; it’s the multi-cultural urban dream, right? And the energetic clash of cultures and influx of new citizens keeps areas alive? Whereas this utter abandonment of a district within ten minutes’ walk of the city centre to shabby warehousing, import-export businesses and decaying surface carpark is baffling to me. As well as the teaching, we went on a Sebald pilgrimage around my adopted home town of Manchester. The narrator of ‘Max Ferber’ in The Emigrants, you will remember, circles around Manchester when he first arrives, and then walks back in to Manchester when he says farewell to Ferber for the last time at the end of the book. We started at the very end, at the Midland hotel, of which the narrator says ‘Today the Midland is on the brink of ruin […] it is presumably only a matter of time before the midland closes its doors and is sold off and transformed into a Holiday Inn’ (E 233). The narrator spends a haunted night behind its ruinous facade. Anyone who’s been to Manchester recently will know that the Midland, far from being a Holiday Inn, has been restored to its former vulgar glory, with a terrifyingly over-priced tea room and plenty of exotic plants. I wouldn’t say that it was still ‘famous throughout the land for its luxurious plumbing’ (E 232), but I can report that it does have very fancy bathrooms. Indeed, the Free Trade Hall, from which the narrator imagines he can hear ‘(though it was utterly impossible) […] the orchestra tuning their instruments’ (E 234) is now a posh hotel as well. Double the bourgeois comforts for the spiritual descendants of mill owners! Manchester itself is so changed that there are barely any ruins at all to be found out at the Quays, by Trafford Park, where Sebald’s narrator finds his enticing sign ‘To the Studios’ (E160). In the semi-privatised Salford Quays spaces built by Peel and leased to the BBC, the only studios around are pretty expensive and decidedly high-tech. So there’s not a trace of Sebaldian melancholy left in Manchester? Oh, of course there is. We walked back out from the Midland back along the route of Higher Cambridge Street, where Sebald’s narrator reports ‘warehouses where the ventilators were still revolving in the broken windows’ (E 232). In post-boom Manchester, these industrial relics have been transformed, Holiday Inn-style, into expensive flats, which provides a nice further turn in the ironies of history, particularly after the credit crunch. Further out along the narrator’s route, he encounters ‘the deserted Hulme estates, which had been rebuilt in the early Seventies and had now been left to fall down again’ (E 232). Infamously, the Hulme crescents – with their crime and their musical subculture – have now been completely razed, and there would have been no hope of recreating the photograph on p. 231. So Sebald’s ruins are now bourgeois capitalist palaces again, and his relics of modernism are erased. At the end of the walk, we went to Angel Flags and I pointed out Strangeways, still the grim star-shaped panopticon that Sebald describes, with a little more infamous history attached now. And ‘the one-time Jewish quarter around the star-shaped complex of Strangeways prison’ that he reports in the north of the city is still there, mouldering away. ‘We could go wandering there too,’ I suggested, in the darkening March evening, ‘…but we are also next to the Marble Arch, and could have a legendary Manchester pint, also’. And so we did, which was a lovely end to our travels too, even if entirely un-Sebaldian. (All references are from Sebald, The Emigrants, tr. Michael Hulse (London: Harvill, 1996). The project commissions international experts on Holocaust literature to write about the relationship between the almost forgotten Holocaust survivor and writer H. G. Adler (b. 1910), and the celebrated writer W. G. Sebald (b. 1944), as a case study of a late 20th-century Holocaust writer re-discovering and re-canonising an earlier witness. In 2001, W. G. Sebald drew on Adler’s Theresienstadt: Antlitz einer Zwangsgemeinschaft (1955) in his novel Austerlitz. This revived interest in the poetry and novels of Adler, which, although largely ignored on their initial publications between the 1950s and 1989, are now being translated into English and attract growing critical attention. This project uses this as a case study of the workings of the ‘cultural field’ (Bourdieu) in relation to the circulation and reception of Holocaust writing. It forms an initial investigation into the wider relationships between the first literary witnesses to the Holocaust and subsequent discourse about testimony to historical traumas. It questions how cultural legitimacy has been granted to certain ‘first voices’ of the Holocaust while being denied to others. The main output will be a volume discussing the wider significance of the Adler-Sebald literary relationship.